Ten Documents That Every Student Should Know and Understand! Higher Ordered Thinking through Documents (or H.O.T.-DOCS) is a document-based interdisciplinary curriculum that helps students to think critically, and to read and write effectively. 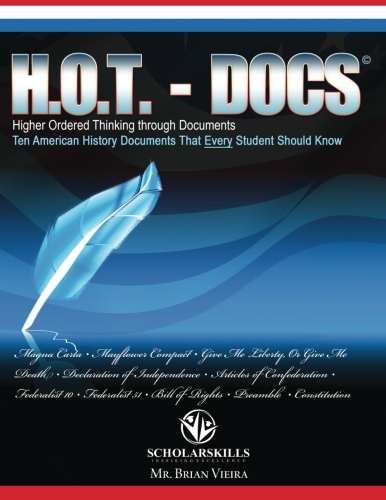 H.O.T.-Docs is an interactive, guided analysis of the ten transformational primary source documents which are the foundations of our freedoms. Our goal is to make these documents easier to analyze and to understand so that teachers, parent-educators, and students could learn about America's great history directly from its original sources. You may also download the sample document (The Mayflower Compact) and watch a video introduction to our Declaration of Independence document study. If you have any questions, please feel free to contact me directly at contactme@scholarskills.com.